Sandstone Chiropractic Conroe is our latest addition to the Sandstone family! Our mission is to provide quality care to as many people as possible, and Conroe was the most obvious choice. Located less than a block from I-45 for ease of access. Experience the same great care and innovative therapies that Sandstone Chiropractic provides. Dr. Chantelle Kempinski heads the Conroe office. At Sandstone Chiropractic Conroe we accept most Blue Cross Blue Shield (PPO), United Healthcare, Aetna and Medicare plans. 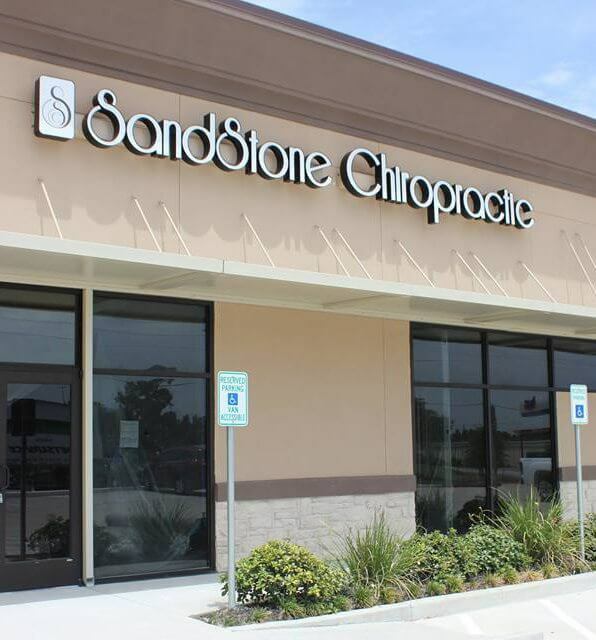 Sandstone Chiropractic Conroe is our latest addition to the Sandstone family, and it’s located less than a block from I-45, for ease of access for all of our valued patients. We’re happy to be able to serve the community in Conroe, and as with all of our practices, we have put in a lot of effort to make sure that you feel right at home as soon as you walk in. This is something that we really pride ourselves on, and an environment that we always strive to create! We’ve designed practices that promote relaxation, so that we can all focus on what really matters: the continued level of care that we provide here at Sandstone Chiropractic Conroe, no matter what services you require. At Sandstone Chiropractic, we have a long history of providing the best quality service to the communities that we care about. Conroe was an obvious choice to us, due to the 5 other healthcare practices that we have spread across the state. 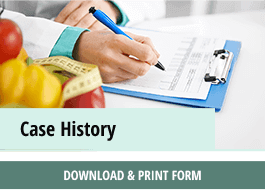 Serving the people of Texas is what we value the most, and this is where our history as Sandstone Health was shaped and developed. We care about the lasting relationships that we have with all of our patients, and we know that we can cater to the needs of the community that we have been a part of for so many years. Conroe is the perfect place to provide important care to as many people in the community as possible. We’re located across from Cracker Barrel off of League Line Road. There’s plenty of parking in the shopping center’s lot. We care about making sure that we’re doing everything we can for our patients, and this starts the minute that you walk through the door. Not only will you be greeted by a helpful patient coordinator when you arrive, but we provide every one of our patients with a thorough consultation, so that we can be sure we’re giving you the focused care that you need. We never jump straight into giving you treatments, and we pride ourselves on making sure that we know you and your requirements fully, and that you’re ready to move on with your treatments. Everything we do is at your pace, and the care we provide is tailored totally to you. 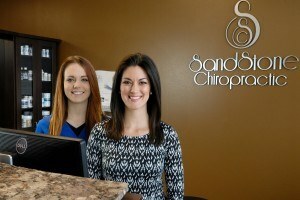 At Sandstone Chiropractic, we know that our patients have busy lives, and we want to make sure that we can give you the care that you need, without spending hours in long doctors appointments, trying to get to the bottom of your health issues. We have a talented team of chiropractors, led by Dr. Chantelle Kempinski, who have an extensive history in providing the best level of care to all of our patients, and they want to work with you to come to a solution that is perfect for your needs. Our great team is comprised of two compassionate and empathetic professionals, who have extensive experience working with the people of Texas. At our Conroe practice, we offer the same great services, and the innovative therapies, that we offer throughout Sandstone Health. Our services are varied, and depend upon the care that you need for your specific health conditions, but include Arthrostim©, Torque Release, and Diversified, Gonstead, and Webster techniques. We give all of our patients a thorough examination, to see which services would work best for you, and we’re proud of our high success rate. In fact, many of our patients note a 100% recovery, and whilst everybody’s journey is different, this is what we aim to provide for everybody who walks into one of our practices. 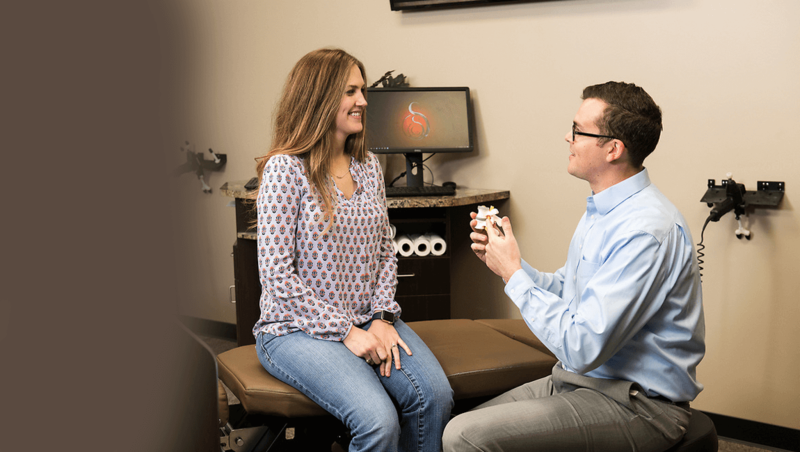 We understand that you may visit a chiropractor for a number of reasons, and because of this, we treat a wide range of conditions in our Conroe practice, and throughout our Texas offices. Whether you’re suffering from back pain, neck pain, or headaches because of illness or disease, or because of age or poor posture, we work with patients with a variety of different conditions, and we will tailor your care around the causes of your pain, and the conditions that you have. Not only do we provide quality care in our practices, but we tell you how to deal with your pain in your day-to-day life, and we will give you all of the information that you need to make a full recovery. 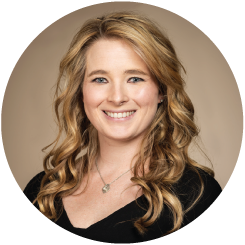 Our Conroe practice is led by high-class specialists, and Dr. Chanelle Kempinski heads the chiropractic clinic. She has a diploma in Pediatric Chiropractic from the International Chiropractic Pediatric Association, and her interests are in family wellness, as well as exercise and nutrition, which allows her to provide a well-rounded approach to the health of our patients. Dr. Jill Crocker also has a certification in Functional and Kinetic Treatment with Rehab (FAKTR) and graduated from the University of Texas with a degree in Kinesiology. Our high-class specialists are passionate about the Texas community, and prioritize lasting, supportive relationships with all of our patients. We know that choosing the right chiropractor is deeply important, and it can be a difficult task. However, we know that we provide the best services to our patients across Texas, and our reputation, positive reviews, and the community that we have created throughout our practices only serve to reinforce the fact that we provide an extremely high standard of care, no matter what conditions you have, or what treatments you require. Whichever one of our practices that you visit, we can reassure you that you will be made to feel at home immediately, and that you will be in a relaxed, positive, and respectful environment. At Sandstone Chiropractic Conroe, we also accept most Blue Cross Blue Shield (PPO), United Healthcare, Aetna and Medicare plans. See some of our testimonials here. 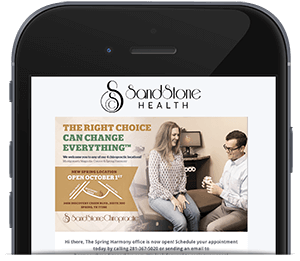 So, why not book an appointment at Sandstone Chiropractic Conroe, and join a community of people who strive for better health across the state of Texas? Please don’t hesitate to get in touch with us below to request an appointment, or call us on 281-203-0070 for more information about how we could help you! Dr. Chantelle Kempinski graduated with honors from Life University in Marietta, GA in March 2013. While attending Life University, she also obtained her Diplomat in Pediatric Chiropractic through the International Chiropractic Pediatric Association. 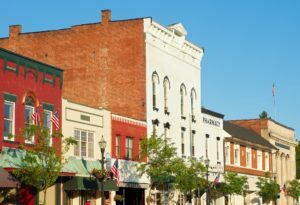 Previous to chiropractic school, she attended Central Michigan University where she earned her Bachelor of Science degree in Exercise Kinesiology. Dr. Willis graduated from the University of Texas in San Antonio with a Bachelor of Science degree in Kinesiology with a concentration in Athletic Medicine. In August 2017, she graduated from Texas Chiropractic College where she also obtained a Bachelor of Science degree in Human Biology and a certification in Functional and Kinetic Treatment with Rehab (FAKTR). 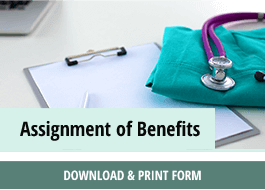 Annual Wellness Exams are performed once a year in an effort to gain information about your body and any potential problems it might experience. Stem cell injections come in many forms. Stem cells can grow into any type tissue. The number of injections depends on the injury or level of degeneration. Virginia is an Integrative Nutrition Health Coach certified by the Institute for Integrative Nutrition (IIN). Our rehabilitation program meets the individual needs of injured athletes and participants in everyday leisure activities of all ages who seek treatment methods in order to rebuild and repair the body. PEMF is ideal for patients’ post-surgery, patients looking to find relief from old injuries, increase energy and helps to improve overall health. Whole Body cryotherapy is used for both athletes and the everyday person. We offer a multitude of chiropractic adjusting techniques to cater to each patients individual needs. The computerized traction head and doctor skill are the keys. When you first come into our office, you’ll be greeted by our patient coordinators and given paperwork to complete. If you’d like to fill your paperwork out ahead of time, feel free to download it, print and bring it with you when you come. Once your paperwork is complete and all your questions are answered you’ll see Dr. Thomas for a consultation and examination. This may include X-rays, if needed. We don’t need to start your care that day, but want to take this time to get to know you and what your body needs to be its healthiest. We’ll fully walk you through the process of care step by step, and it’s always your decision to move forward. If necessary, we’ll be able to start relief from your pain on this visit. Plan on spending at least an hour with us on your first visit. We’ll schedule you for a return visit on the following day or the day after to do a full report of Dr. Thomas’s findings. She will discuss your X-rays, if taken, and the results from your examination, as well as discuss a care plan to move you forward on your journey to regaining your health. We’re always here to answer any questions you might have about getting help through our healing care.